The 996 generation of the Porsche 911 Carrera is currently the most affordable version of the rear-engined sports car. The reasons for this are threefold; 1: The shape of the headlights; 2: Being the first water-cooled 911; 3: The infamous IMS Bearing. The interesting thing is the Porsche 996 is still a great car, but because of the thoughts of some purists and worries about a possible need for an engine replacement values remain low. For someone dreaming of driving a 911 but without a huge budget, the 996 Carrera can be an affordable and dependable purchase. Now purists are not fans of the headlights because they are not round like every other generation of the 911. The earliest 996 also has the distinction of having a front end that looks almost exactly the same as the less expensive early 987 Porsche Boxster. The only noticeable difference in the front is the different front bumper design. The early 996 examples have the “fried eggs” headlights. These cars were given this name thanks to the yellow indicators that are married to the clear top headlight. Later on in the production run these would be made clear and in the 996.2 redesign the headlights were reworked so that they no longer resembled the Boxster. The redesigned headlights are featured on Sally from the movie Cars. These are still not beloved by purists, but there may be a future demand for these examples as children that grew up watching Cars get older and eventually get enough cash to be in the Porsche market. The 996 generation of the 911 is the first to be water cooled. Now Porsche did use water cooling in the 959, but as that was never officially a 911 and was a supercar by any standard; the 996 gets most of the criticism by pursuits. Sure the character of the air-cooled cars is different, but the water-cooled vehicles showed the way forward, allowing for more horsepower output and air conditioning that is no longer like an asthmatic blowing through a straw. By far the biggest thing that keeps prices of the 996 Carrera down is the fear of the IMS Bearing. The Intermediate Shaft (IMS) Bearing is a known failure point and if it goes it means either an expensive engine rebuild or an equally expensive new engine. The design affects all non-Turbo, non-GT2, non-GT3 996 variants and most 997s as well (non-Turbo, non-GT3, non-GT2 up until 2009). The 1999 and some 2000 models use a more durable dual row bearing design. These are much less prone to failure and according to the class action lawsuit have a less than 1% chance of failure. Some 2000 and all later 996 vehicles used a single row bearing design that have a failure rate of 8% according to the class action lawsuit. The good thing is that IMS Bearing retrofits (some even remove the IMS Bearing all together, similar in design to the 996 Turbo) exist and can help prevent failure of the bearing. The IMS Bearing on the flat-six in the 996 generation cars is externally accessible without the need to open the engine, unlike 2005 – 2008 models. Many will do the replacement when they replace their clutch as it doesn’t add much to the labor costs. Many cars for sale have a retrofit IMS Bearing, so the issue is largely mitigated. Having said this, it is good to ask about it when purchasing a 996 Carrera and if it hasn’t been done use that as a bargaining chip to lower the price by about $2,000 so that you can get it taken care of. All of this IMS Bearing talk can scare many away from a 996 Carrera, but there is no more reason to be frightened of owning a 996 than pretty much any other sports car as most have some sort of self destruct button. 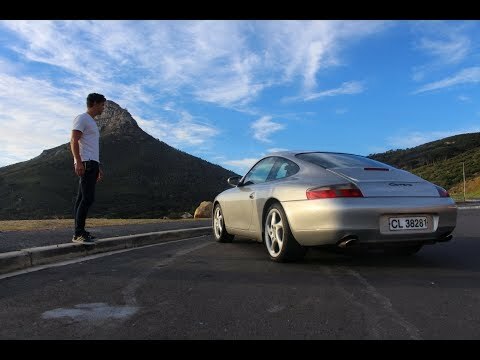 The good thing with the Porsche 996 is that it can be proactively handled. The wonderful thing for those of us looking for a sports car bargain is that this fear as well as purists opinions help make these cars very affordable. For less than a new Honda Civic, you can drive a Porsche 911 with about 300 horsepower on tap. The 996 Carrera is also one of the last generations of the 911 to have a very analog driving experience. The steering feel and relative lightness of the car helps the driving experience feel very nimble. It is also a smaller vehicle than later 911 variants and this adds to the sports car feel. The interior is not as nice as later 911s, but it has shown to be durable and is still up to most high-end sports cars of its era. It is a pleasant place to be and everything that needs to be touched is put in easy reach of the driver. It is a new enough car that enough modern conveniences were available as options, so you don’t feel like you are going back too far in time. From a performance stand point the Porsche 996 Carrera provides just about the right amount for fun on the streets. If you go for the six-speed manual transmission you can launch from 0-62 mph in just 5.2 seconds. The Tiptronic version is almost a second slower to get to the same mark with a 6 second flat time to 62 mph. All out the manual car can hit 174 mph and 171 mph for the Tiptronic. The 2002 model year saw a slight performance bump thanks in part to a horsepower increase to 320 horses. This helps the 2002 – 2004 996 Carrera go from 0-62 mph in 5.0 seconds for the manual transmission and 5.5 seconds for the Tiptronic cars. The top speed also raised to 177 mph for the manual car and 174 mph for the Tiptronic vehicles. From a pure performance stand point the six-speed manual is the car to get. Having the third pedal also adds to the driving experience. Having said this, if you aren’t as worried about having the most performance possible, then the Tiptronic car is often slightly less expensive and is easier for those needing to drive in city traffic. Based on our research below is the current going rate for a 996 Carrera in running condition. The low end of the price scale will get you a higher mileage car with some needs and the upper end of the scale will get you a better maintained lower mileage example. As with any older high end performance car a pre-purchase inspection is a very good idea. Doing so can find hidden issues and could save you thousands in repairs by letting you if you should walk away from a car. It can also give you a bargaining point to help lower the price. Keep in mind that there are a good number Porsche 996 Carreras for sale, so be patient and take your time to find a good well maintained example. If you do so, you can enjoy a 911 for a good price that is likely to last without much trouble. Trouble watching the video? Go to the original YouTube video.